Many recent studies confirm the importance of healthy eating. Starting with a broad study links obesity with stress. If you’re overweight, you may be at greater risk for stress-related diseases like type 2 diabetes, cardiovascular disease and cancer, according to a new study. Moving to more specific studies like this one, showing how fruit and vegetable consumption is not only good for physical well-being, but also mental health. 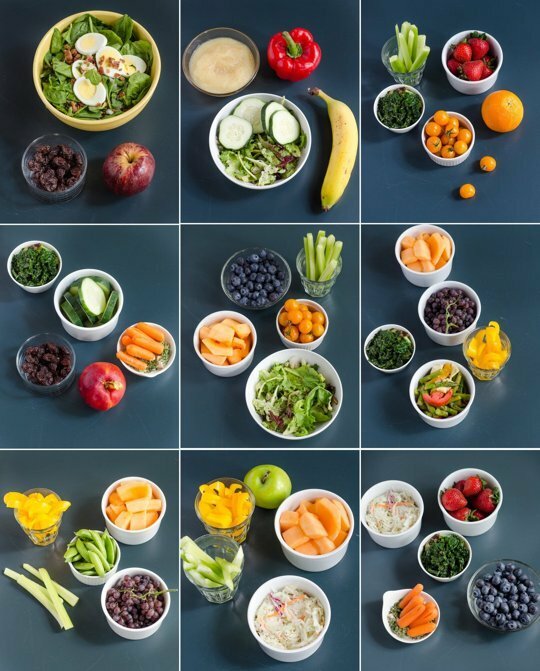 Below are nine nice visualization of how many fruits/veggies you should be eating in a day: This is based on the Centers for Disease Control and Prevention (CDC)’s Daily Recommendations. The CDC reported in 2010 that only 33% of adults were eating the daily recommended amount of fruit, and even fewer —27% — were meeting their veggie quota. They went on to explain in a 2000 calorie daily diet a person needs to eat 2 cups of fruit and 2 1/2 cups of vegetables everyday. Bonus tip- Imagine that your hands are warm. Yes this sounds different and weird but trust me, when you are in a stressful environment your hands will get cold. If you imagine that your hands are warmer than they really are, then this type of biofeedback actually helps your body! Try it! I believe you! 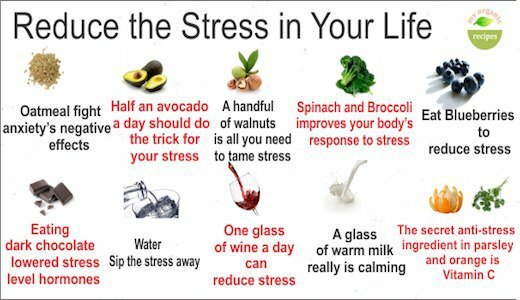 I believe you can manage your stress. I believe that you can be free from the heavy burdens that seem to be pulling you down. I believe that you can direct your thinking, learn to relax and take control of all areas of your life. I want you to live in a world where stress and anxiety are not ruining your life. I want you to live in a world where you are liberated from unhealthy habits and distress. Here is what I know for sure: life is a balancing act. We must take care of our self. This balance is a holistic view of self. Life needs examined and challenged for full potential and growth. I want to help you live that way. This is my mission and my manifesto. Often times we hold images in our minds from our harshest critic. We can be kind to others. We are shepherds and we are caretakers to others. Although we are awfully hard on our own self. In reality both sides are battling it out inside of our heads. Imagine the old cartoons, where there is a devil (or a critic) on our left shoulder and an angel, (the caretaker) on our right shoulder. Both are whispering in our ears, what we need to hear. I challenge you to take five minutes to think through and write down what each voice has been telling you. If you are being honest with yourself, you will hear your own inner-critic first and then notice your strengths, second. It is natural for our minds to be so focused on the negative first. Although, we can learn to control our thinking. The first step is practicing being mindful. Try being here-and-now. Do not focus on what you have to get done in two hours or later tonight. Be present with yourself, right here and right now. First this starts with breathing. Keep your eyes open but just focus on your senses rather than your thoughts. Notice the environment and what you are feeling, sensing, breathing, seeing around you …. What are you seeing? Look only at one thing at a time. If you are thinking about what you are thinking and interpreting, you are no longer being mindful. Attempt to perceive without judgments, interpretations, evaluations or too much input from the brain. You should have a running commentary of what you are experiencing right now. This exercise was meant to help us become more alert and aware of our surroundings. Mindfulness is “thinking about thinking.” We do have some control over our thinking. We call this being “mindful.” Being mindful can help us de-stress and relax. Doing this meditation will help you be more present in the here and no, not distracted by thoughts and judgments. At work, be fully attentive and present at work. But then at home, be fully present with your family, instead of focusing on your thoughts and worries of work. Next week, I will offer some more techniques to help you de-stress and be even more mindful. 1. Make use of and promote Board of Pensions and denominational resources for clergy wellness. 2. Make available clergy and educator support groups and clergy spouse support groups. 3. Contract with local resources to provide confidential therapy services for clergy, educators, and their families. 4. Encourage ―Facebook or other online support/interest groups. 5. Write boundary expectations into calls and covenants for clergy and educators whereby the congregation agrees that their spending time with spouse and family is expected, days off are protected, and participation in the activities and leadership within the local community is encouraged. 6. Either in the church‘s call or the presbytery‘s budget have funds available for clergy/educators recreational activities or hobbies. 7. Form a pastoral care team and/or have a designated pastor-to-pastors and chaplain for spouse of clergy or educator. 8. Be creative in sponsoring clergy and educator retreats and outings (cruises, fishing contests, golf matches, tickets to concerts and civic events, tours or trips). 9. Arrange for corporate contract membership fees for the YMCA, YWCA, or a health club within the bounds of presbytery. 10. Sponsor health fairs and wellness contests for clergy/educators and their families. 12. Develop a ―First Call‖ program for new clergy retention and wellness. 13. Sponsor annual clergy, clergy/spouse, and educators retreats. 14. Consider sponsoring quarterly district luncheons. 15. Acknowledge clergy/educators‘ anniversaries, birthdays, ordination dates, etc. 17. Make sure spiritual resources are available and their use encouraged by clergy/educators and their spouses. Most pastors understand their call to ministry as extending beyond just the activities of their local congregation. In a parallel fashion to having responded to an inner-sense that moved them to enter the ministry, so they develop an interest in some particular aspect of their call that extends beyond their particular congregation. It may be an ecumenical or even inter-faith ministry in the community, a national issue about which they feel passionate, or an activity in their denomination‘s work. In support of the vocation of pastors, what if the presbytery occasionally lifted up and celebrated these many trans-congregational ministries of their pastors? A first step in support would be simply to have conversations with the pastors about a particular area of ministry in which they feel most passionate. Even the opportunity to name that for someone else and share what they are doing in that area would feel good. A second step would be to provide a venue by which that area of ministry might be celebrated. That might begin by collectively celebrating the many areas of ministry in which people are engaged. You might say at a public gathering, ―In our conversations we have learned that the clergy of our denomination, in addition to their work in their congregations, are engaged in the following areas of ministry. And then have the body participate in a litany that named and thanked God for having called pastors to participate in these areas of ministry. If the numbers were not too great, it would be good to name the pastors even as you identified the areas. For example, ―John Smith, Ellen Jones, etc have devoted their gifts in a ministry to feed the hungry.‖ To which the body would respond, ―We thank God for their efforts on behalf of the least of these, our brothers and sisters.‖ Then proceed to the next area of ministry to be identified. If it was a large presbytery, you might want to break the recognition down into geographical areas and celebrate one area at each meeting (See the adaption of Psalm 111 Litany of Celebration). A third step would be to invite a group of clergy with a similar focus to develop a short presentation to the body about their work. Simply drawing them together to talk about their similar efforts would have its own value. The public presentation might stimulate others who might be interested in that area as well. All of this would be a presbytery‘s way of nurturing the larger sense of call among their clergy. As a pastor, it is easy to go it alone. It is not uncommon for pastors to feel lonely and not have any true friends. This pattern needs to end. God created you to be social creature. Yes you have a calling to be a pastor. Yes, you are called to high things, but you are also called to do this life together with friends. You are not made to be alone in this journey. Pulpit & Pew’s 2001 national clergy survey asked pastors how often in the past year they had felt “lonely and isolated in their work.” About 17 percent said “very often” or “fairly often” and another 51 percent said “once in a while.” Only 32 percent said they had never felt lonely or isolated. Loneliness and isolation were the single greatest predictor of overall job dissatisfaction. Generally, those who had the highest levels of loneliness were the most likely to be dissatisfied in their ministry, while those who reported little or no loneliness had the highest levels of job satisfaction. Another Pulpit & Pew study also found a strong link between loneliness and clergy dropout. In that study, researchers interviewed ex-Catholic priests who had left the priesthood within five years of ordination. They found that isolation and a lack of close friendships were one of the most important reasons the former priests cited for quitting the ministry, second only to celibacy. 1. Don‘t burn your former bridges. Keep close phone and/or Internet contact with best friends or close family members. 2. Seek new friendships in social and community settings that fall outside of the boundaries of your local congregation. You will not develop outside of church friendships without actively placing yourself in social situations where friendships may develop. 3. Form cordial and friendly relationships with church members but be judicious about divulging too much personal information. Other church members get jealous of the clergy and spouse‘s ―in church relationships. Also, many a clergy family has felt betrayed by a close friend when church conflicts surface. 4. Seek other clergy (along with clergy spouses) for support and fellowship. 5. Make it a priority to have some personal, outside of church interests, hobbies, sports, or goals. Pursue your passions! 6. Therapy is good for the soul. Don‘t neglect your emotional self, especially if you are in pain. 7. Become part of a clergy (or clergy spouse) support group, lectionary study group, spiritual formation group, book club, etc. 8. If single, date outside of your church‘s membership. 9. If married or in a relationship with a significant other, have a set weekly ―date night. 10. Take all of your vacation time and study leave and make sure it‘s away from your local community. 12. If married, make a list of future goals and activities that you would like to experience together (e.g. hiking in the Andes, skydiving, kayaking the Amazon, picnicking in a secluded meadow, bird watching, gardening, etc.). 13. Seek out someone to be your pastor and/or spiritual director. What other creative suggestions can you add? Share these strategies with other pastors and spouses. Be willing to contact your presbytery committee on ministry if problems arise. This is part one, I will post part two next week. Imagine a situation with me. If you felt called by God to walk into a cancer ward and to pray for an individual and image that God healed that person. Immediately. The newly healed person felt healed and there was absolutely no sign of the cancer in this person anymore. You and this person would be ecstatic and jumping up and down on the bed. The nurses and doctors would not know what to do. Then as you walked out of the room, you felt God call you to another room to pray for someone else. Then imagine a similar situation occurring, where God heals the person you pray for. If this continued to happen time and time again, at the very least another sick person with cancer would be calling you, more likely the doctors would want to know what you were doing and even more likely the news would be putting you on the spotlight. This is just one fictional example of what it might be like to experience what Jesus might have experienced. Can you picture it? Jesus must have been in high demand! There must have been word out of his miraculous healings and wonders. I am sure that people were well aware of what he was doing and I imagine that people wanted his time and his healing touch. Mark 1 : 35 (NIV): Very early in the morning, while it was still dark, Jesus got up, left the house and went off to a solitary place, where he prayed. Mark 6:46- Jesus, after a busy day of healing people, sent people away so that He could be alone in prayer. If you continue reading the chapter there are still people lined up looking for Jesus (v. 55). Again in Matt. 14: 22-23, Jesus dismissed the crowds, so He could go to the mountainside by Himself to pray. Jesus’ priorities were very clear. Luke 5:16 says that Jesus often withdrew to lonely places and prayed. This was a habit for Jesus. Jesus quietly slipped away again and again, as it is mentioned in Luke 9:10 also. Jesus rested on the Sabbath and went to the synagogue (Lk. 4:16), the equivalent of going to church on Sunday. The morning before choosing His twelve disciples, Lk. 6 reports that Jesus spent the night in prayer. Throughout His time on earth as a human, Jesus modeled the importance of taking time off to recharge. This involved a lot of prayer. His source truly was God the Father. We too can follow this example and knell before the Lord God, our Father for strength and refreshment as well.